LITTLE ROCK — Grant money from a federally funded Farmers Market Promotion Program will help two Arkansas-based nonprofits move forward this year with efforts to attract more low-income customers at farmers markets in their communities. The U.S. Department of Agriculture is hopeful grants will increase access to locally grown fruits and vegetables across the country and help counter obesity and diabetes, which are prevalent among lower income populations. An estimated 40 percent of the state’s population is classified as low income, according to data from Arkansas Advocates for Children and Families. Meadowcreek Inc. in Fox, in Stone County, and Main Street Helena in Helena-West Helena are using USDA funding to help ensure a supply of fresh produce to farmers markets, extend the growing season for farmers supplying markets, and help promote the markets themselves through initiatives specifically directed at the obese. Academic research suggests that the poorest and least-educated people have the highest rates of obesity. Beverly Dunaway, director of the Meadowcreek Link-Project, said receiving the $95,000 USDA grant wouldn’t lead to any quick fixes to the food choices among low-income residents in north-central Arkansas. Through Meadowcreek’s LinkProject, low-income residents will be courted through the Link, Lunch and Learn program. The program will feature topics such as “Taters in Tires,” where used tires serve as above-ground planters to grow healthy foods at home. Advertising is being done through a local “food room” that’s part of a community-run food donation program in nearby Mountain View. The educational series will distribute vouchers for fruits and vegetables redeemable at the Stone County Farmers Market in Mountain View. The grant money also is being used to teach farmers techniques to extend their growing seasons. A series of workshops is being held to build “cold frames,” or unheated greenhouses built low to the ground. The covering keeps the soil warmer during the winter months, allowing produce to be planted earlier in the spring, and help vegetation survive longer into the colder months. So far farmers have the cold frames set up on eight farms in Stone and Searcy counties, she said. 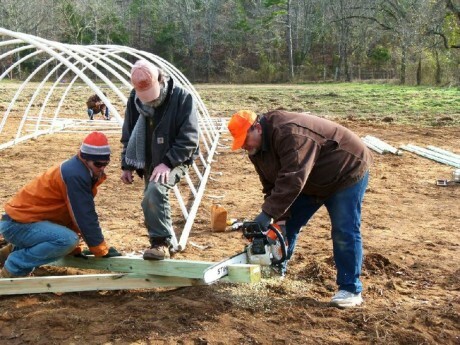 Cold-frame workshops are scheduled through the winter season. The Downtown Helena Farmers Market is expected to benefit in part from a $39,000 grant seeking a connection with low-income shoppers through a doctor’s prescription. Julia Nordsieck, a spokesman with Southern Bancorp Community Partners, which oversees the distribution of grant funds, said details were still being worked out on a program in which physicians could write prescriptions, in the form of a voucher, for patients to receive fruits and vegetables from farmers markets. The prescription program is expected to provide healthy food for the patient and introduce a new demographic to the local farmers market. Though not funded by the grant, a machine to electronically process food-stamp benefits at the Downtown Helena Farmers Market will be new this year, said Tyson Pease, outgoing Helena-West Helena farmers market manager. Heather Friedrich, manager of a University of Arkansas Division of Agriculture project to promote farmers markets and healthy food choices, said the USDA has earmarked grant money to place food stamp machines in markets across the country. In Arkansas, at least $68,500 has been disbursed for the purchase of machines since 2008. Participation in the Farmers Market Promotion Program over the years has resulted in food-stamp card reading machines being available in about 15 of the estimated 80 farmers markets in Arkansas. The Farmers Market Promotion Program has about $10 million to allocate through its grant-making process for fiscal year 2012, the USDA reported. Programs such as the Women, Infants, and Children and the Senior Supplemental Nutrition Assistance Program have their own farmers market voucher programs to influence food choices made by those with fixed or low incomes. Low income is defined as an annual income that is twice the federal poverty guideline or less- or $21,660 for individuals and $44,100 for a family of four, according to data from the U.S. Department of Health & Human Services. The USDA says people without ready access to “fresh, healthy and affordable food,” and those who rely on fast food and convenience store foods, have a higher incidence of obesity and other diet-related diseases such as diabetes. In Arkansas, more than 60 percent of adults are overweight or obese, according to data from the state surgeon general. According to an example from the Centers for Disease Control’s body mass index, an adult who is 5 feet, 9 inches tall and weighs between 169 and 202 pounds is considered overweight, and being above that weight is considered obese. Accepting food stamps and vouchers from programs such as the Women, Infants and Children food nutrition program are ways to connect low-income people with fresh fruit and vegetables at farmers markets, said Joy Rockenbach, co-chairman of the Arkansas Coalition for Obesity Prevention. When discussing farmers markets as a shopping destination for low-income people, Rockenbach said she doesn’t want to throw out the proverbial baby with the bath water. “The bottom line is you want good healthy food on the table” and it doesn’t matter where it comes from, she said.